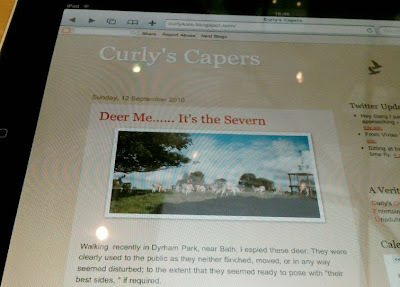 as, you may see, it is a picture of my blog. This new portable computing touch screen device, has a great bright 10inch display, combined with fast loading capabilities and I was very favourably impressed. I hope in this third year of the blog to introduce some video content, as well as continue with the photographs. STOP PRESS: just added (24/09) Video Bar, now watch Gary Lucas, Beefheart, Sun Kil Moon and Emerson, Lake & Palmer: Neat ! Tread carefully, ancient ground lies under your feet. Cracked and parchment brown, in summer heat. the Ridgeway cuts through The Valley of The Horse. Which I caught near the 'Globe Theatre'. It was great to sit in the craft and watch the Thames flow by me. 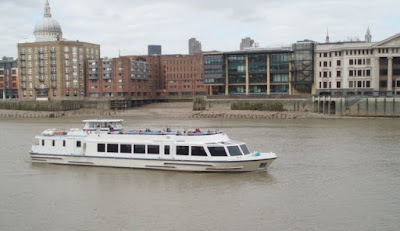 Because it was a water bus ( linked by ticket to the underground service), there was no annoying chat by a tour guide leaving my neck in one place and not being overloaded by information. Soon I arrived at London Bridge. It was fascinating to view the ever changing sky line. I decided to leave the craft at the O2 Stadium ( olders readers , think Millennium Dome ). It is a remarkable building; especially in its internal dimensions, which allows for a multi- function capability. Many of the usual corporate food outlets are in place, waiting, it seemed to me for a stadium audience. I ventured into a 'hands- on' display area, sponsored by Nissan Cars; it pointed up, to the coming green future and allowed me to post an instant video on the video talking wall. Walking recently in Dyrham Park, near Bath, I espied these deer. They were clearly used to the public as they neither flinched, moved, or in any way seemed disturbed; to the extent that they seemed ready to pose with "their best sides, " if required. Today (12/09/'10 ) I found myself at Westbury Court Garden, on the edge of The Forest of Dean. It is the only preserved Dutch Water Garden in the Country. as you can see from the above photograph of the view from the main entrance. The gardens also put on a dazzing display. I had visited a few years ago and had forgotten how grand it was. 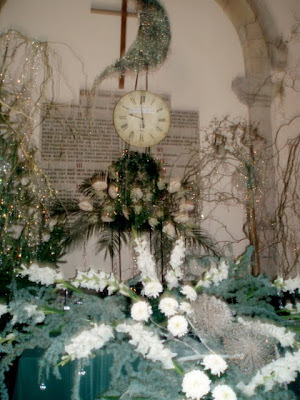 This rather ethereal picture, was taken at a flower festival in a church dressed all in white. It reminds me that winter is not too far away.